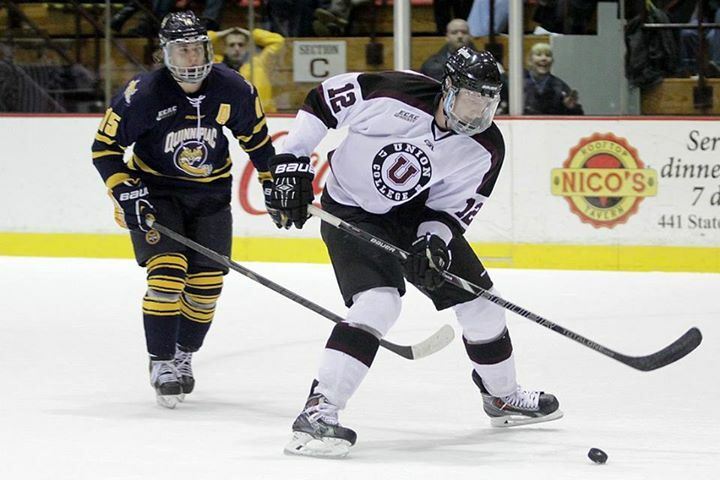 Union College Canadian legionnaire ELI LICHTENWALD (12), the sizable freshman (6’6″ 235 lbs) from Saskatoon Saskatchewan who has totaled thirteen points (seven goals) in his first eleven NCAA contests, outpaces countryman KELLEN JONES (15) of Quinnipiac University, the undersized (5’9″ 165 lbs) senior center who was chosen in the seventh round (# 202 overall) of the 2010 National Hockey League Draft by the Edmonton Oilers, and prepares to close out this pivotal ECAC Conference clash by scoring into the empty net at the Frank L. Messa Rink in Schenectady, New York, on December 7, 2013. 8 wins … 6 losses … 4 ties ………… # 27 – R.P.I. 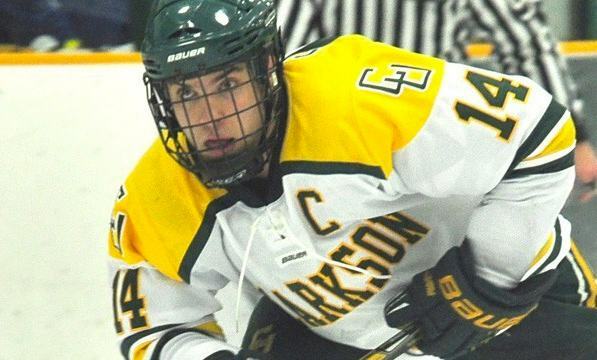 Clarkson University Canadian legionnaire BEN SEXTON (14), the 22-year-old senior center who was tabbed in the seventh round (# 206 overall) of the 2009 NHL Draft by the Boston Bruins, and the Golden Knights are ranked # 9 in the nation by both the USCHO.com and USA Today/USA Hockey polls at the moment but will soon have their mettle sincerely tested by facing off against a pair of formidable Hockey East conference opponents, (# 10) UMass-Lowell and host Vermont, at the upcoming Catamount Cup in Burlington. Half of the twelve ECAC Conference squads will be back in action the first weekend after Christmas. Ivy Leaguers Cornell and Princeton are both migrating south to participate in the 14th annual FLORIDA HOCKEY CLASSIC, a tournament which is always held in in the little southwestern town of Estero (total population of roughly 18,000 people) at the Germain Arena (official capacity for 7,082 spectators), the regular rink of the East Coast Hockey League’s Florida Everblades. Another Ivy League institution, Dartmouth College, will be hosting its traditional LEDYARD NATIONAL BANK CLASSIC holiday gathering which will include the United States Air Force Academy, Northeastern University as well as Providence College. Finally, as far as the Ivys are concerned, the defending NCAA national champions from Yale will host visiting Holy Cross in a non-conference affair. Quinnipiac University will be taking part in the almost all-Connecticut tournament otherwise known as the UCONN HOCKEY CLASSIC while Clarkson University from northern upstate New York is making the trip east into Vermont and will skate at the 17th installment of the CATAMOUNT CUP. St. Lawrence University prolific Canadian legionnaire GREG CAREY (10), the undrafted, 23-year-old senior from Hamilton, Ontario, who topped the Saints with both 28 goals and 51 points from 38 NCAA games last term, is currently leading all players skating for the various 59 Division I men’s ice hockey teams this season with both 38 points as well as an average of 1.89 points per game. 26 pts … 18 go ….. 8 as … 17 ga …… Ryan HAGGERTY, R.P.I. 20 pts … 12 go ….. 8 as … 18 ga …… Brock HIGGS, R.P.I. 18 pts ….. 7 go … 11 as … 18 ga …… Matt NEAL, R.P.I. 17 pts ….. 4 go … 13 as … 17 ga …… Jacob LALIBERTE, R.P.I. Harvard University Canadian legionnaire RAPHAEL GIRARD (30), the undrafted, 22-year-old senior goaltender from St. Hyacinthe, Quebec, who has been sharing the playing time with sophomore teammate Steve Michalek, the sixth round (# 161 overall) pick of the Minnesota Wild at the 2011 NHL Draft, for Crimson coach Ted Donato this season, currently leads all netminders in all of Division I who have appeared in a minimum of one-third of their team’s NCAA games this term with a sparkling .948 save percentage. 2.17 avg … .922 svpct … 17 ga …… Scott DIEBOLD, R.P.I. One player deserving of honorable mention is Rensselaer Polytechnic Institute goaltender SCOTT DIEBOLD, the homegrown junior from Buffalo, New York, who has done yeoman’s work since being pressed into action after an early, season-ending injury to the Engineers’ projected starter. Canadian legionnaire JASON KASDORF, the sophomore from Winnipeg, Manitoba, who was the sixth round selection of the Winnipeg Jets (# 157 overall) at the 2011 NHL Draft and had put up excellent numbers (1.62 avg, .935 svpct) for R.P.I. in 23 games as a freshman last term, but was put out of action with a serious shoulder injury after only two games this fall. 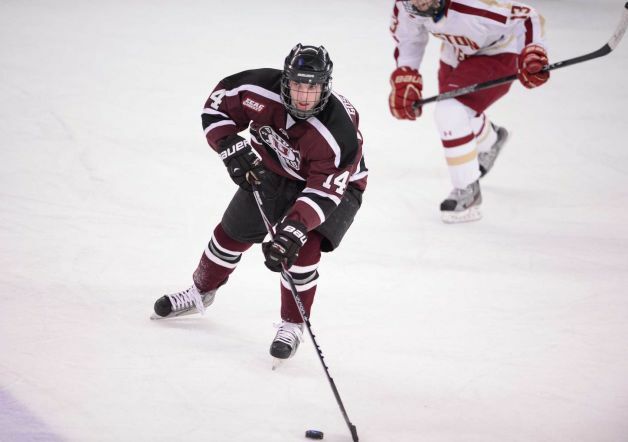 It should be remembered that Diebold, who made just seven appearances (3.22 avg, .873 svpct) as a sophomore during the 2012/13 campaign, had made a total of just 17 career NCAA appearances (3.22 avg, .889 svpct) for the Engineers coming into this current season. 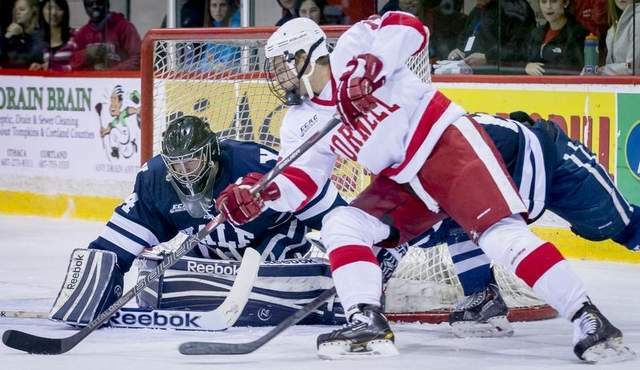 Cornell right wing BRIAN FERLIN (17), the junior from Jacksonville, Florida, who was the fourth round choice (# 121 overall) of the Boston Bruins at the 2011 NHL Draft and currently leads the Big Red with seven goals in a baker’s dozen NCAA games this season, has a chance on the backhand against Yale goaltender ALEX LYON (34), the 21-year-old freshman from Baudette, Minnesota, who has established himself as the first choice between the pipes for the defending national champions this term, during the ECAC Conference / Ivy League tilt at the James Lynah Rink in Ithaca, New York. After falling behind by a couple of goals halfway through the contest, it was only a pair of power play strikes in the final period, the second of which arrived with but a mere 20 seconds remaining on the game clock, that allowed the hosts to escape with a share of the spoils as # 1 ranked ST. CLOUD STATE rallied late to tie visiting UNION COLLEGE and avoid an embarrasing two-game sweep in the NCAA non-conference series this weekend. The two-time defending ECAC Conference tournament champions, after registering a big 4-1 victory on Friday night, looked to be in great shape on Saturday evening, as well, after scoring three unanswered goals in the second period. A power play strike from Canadian legionnaire DANIEL CIAMPNI, the junior left wing from Concord, Ontario, who is tied for the Union College team lead with nine goals this term, a beautiful backdoor tap-in from Canadian legionnaire DANIEL CARR, the senior left wing from Sherwood Park, Alberta, who leads the Dutchmen with 22 points (nine goals) in 16 NCAA games this season, and an accurate shot off a faceoff from Canadian legionnaire ELI LICHTENWALD, the towering (6’6″ 235 lbs) freshman from Saskatoon, Saskatchewan, who has now scored seven goals in his first eleven collegiate contests, erased an early deficit and provided the in-form Dutchmen with a 3-1 lead after forty minutes. After being heavily outshot in the second period of play, St. 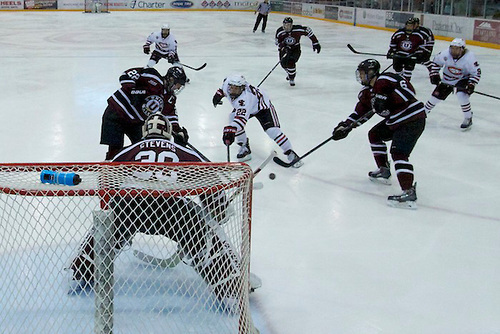 Cloud State turned the tables completely on Union College in the the final frame. JOEY BENIK, the homegrown sophomore left wing from Andover who his the fifth-leading scorer for the Huskies this season with 12 points, bagged his second goal in as many games against the visiting Dutchmen and provided the Huskies with legitimte hope after Union College defenseman SHAYNE GOSTISBEHERE, the talented junior who was the third round pick (# 78 overall) of the Philadelphia Flyers at the 2012 National Hockey League Draft, went to the sin bin for hooking. The hosts continued to press for an equalizer but, thanks to the work of visiting goaltender COLIN STEVENS, the junior from Niskayuna, New York, who remains unbeaten in his last nine starts this season, would have to wait until the very end. St. Cloud State finally leveled dramatically in the waning moments when prolific center JONNY BRODZINSKI, the homegrown sophomore from Blaine who led the Huskies with 22 goals in 42 NCAA games as a freshmen and was then selected in the fifth round (# 148 overall) of the Los Angeles Kings at the 2013 NHL Draft this past summer, slammed the puck into a wide open net at close range to score his eighth goal this term after controlling a fine centering pass from his linemate Benik. Union College center ELI LICHTENWALD (12), the emerging freshman from Canada who has now collected points in ten of his first eleven collegiate contests in the United States after sitting out seven of the Dutchmen’s first eight games to begin this season, raises his stick after scoring his seventh goal of the season halfway through the NCAA non-conference match with host St. Cloud State at the Herb Brooks National Hockey Center. Union College defenseman JEFF TAYLOR (2), the homegrown freshman from Clifton Park, New York, who made a very nice play in the offensive zone to set up a tap-in goal for teammate Daniel Carr against the Huskies and now counts seven assists after 19 NCAA appearances this season, competes for the puck with St. Cloud State left wing JOEY BENIK (9) during the NCAA non-conference series at the Herb Brooks National Hockey Center in St. Cloud, Minnesota. The ambitious visitors struck twice on the power play late in the first period to seize the advantage and then assumed total control with two more unanswered tallies in the final frame as # 10 ranked UNION COLLEGE upended # 1 ranked ST. CLOUD STATE on home ice 4-1 in the first game of a high profile, NCAA non-conference series. Union College head coach RICK BENNETT, the former Providence College right wing who once skated fifteen games in the National Hockey League for the New York Rangers, made a courageous decision to start a heretofore unspectacular freshman goaltender on the road against the number one ranked team in all of college hockey. But the contest with St. Cloud State represented a fourth game in the last eight days for the traveling Dutchmen plus COLIN STEVENS, the homegrown junior from Niskayuna, New York, had just started the previous eleven matches on the trot for streaking Union College, anyway. And so ALEX SAKELLAROPOULOS, 19-year-old netminder from Tinley Park, Illinois, who brought a less-than-overwhelming save percentage of .860 after his first six appearances of this season with him on the plane to Minnesota, simply responded to the challenge of the situation at hand with a career high 34 saves in what was easily his most sensational performance this term for the defending ECAC Conference tournament champions. Union College center MAX NOWAK, the junior from Oak Ridge, New Jersey, who netted twice when the Dutchmen defeated Brown University 3-1 in the ECAC Conference Touranment Final last spring, and Canadian legionnaire ELI LICHTENWALD, the towering (6’6″ 235 lbs) freshman center from Saskatoon, Saskatchewan, who has now notched six goals in ten games for the Dutchmen since being inserted as a regular in the line-up by Bennett, both got their names on the scoresheet late in the first period of play at the Herb Brooks National Hockey Center. 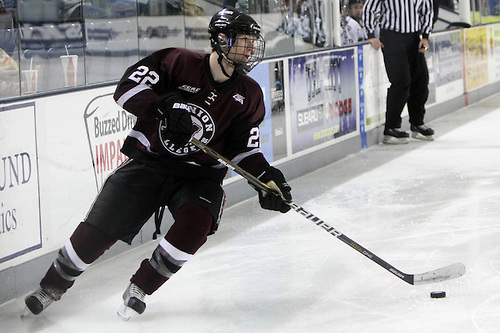 Huskies left wing JOEY BENIK, the homegrown sophomore from Andover, did bring St. Cloud State back to within a goal halfway through the contest, though, after Union College defensemen CHARLIE VASATURO, the blue-collar junior from Sewell, New Jersey, was sent to the penatly box for cross checking. But the visitors benefited from a bit of a break only 43 seconds into the final frame and never looked back. 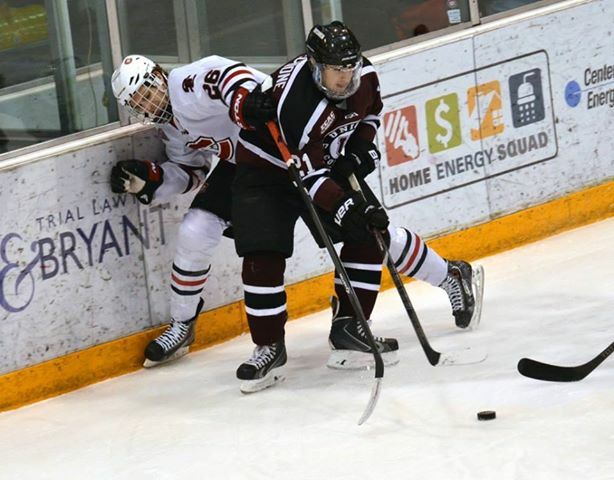 A long wrist shot from out along the boards by Canadian legionnaire MAT BODIE, the senior defenseman from East St. Paul, Manitoba, who was selected as an NCAA (East) Second Team All-America for Union College after his sophomore campaign in 2012, was deflected in front by a St. Cloud State defender and wound up in the back of the Huskies’ net. A fitting reward for the skillful Bodie, who had also assisted on each of the Dutchmen’s first two goals earlier. As for the Huskies starter, RYAN FARAGHER, about seven minutes after this debacle the junior Canadian legionnaire from Fort Frances, Ontario was lifted in favor of 19-year-old CHARLIE LINDGREN, the homegrown freshman from Lakeville, for the remainder of the third period. Any hope St. Cloud State was holding onto was lost when Canadian legionnaire DANIEL CIAMPINI, the junior left wing from Concord, Ontario, stole the puck behind the net in the offensive zone and sent a perfect pass out in front to right wing NICK CRUICE, the sophomore from Dresher, Pennsylvania, who promptly netted his fifth goal this season with less than eight and a half minutes to play. 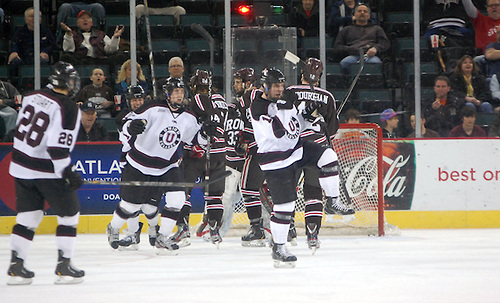 Union College goal-scorer MAX NOVAK (18) chases after the puck with St. Cloud State rearguard ANDREW PROCHNO (28), the homegrown junior from Minnetonka who was the second-leading scorer among all Huskies defensemen with 28 points (five goals) in 41 NCAA games last season, trailing on the play during the important non-conference meeting at the Herb Brooks National Hockey Center in Minnesota. 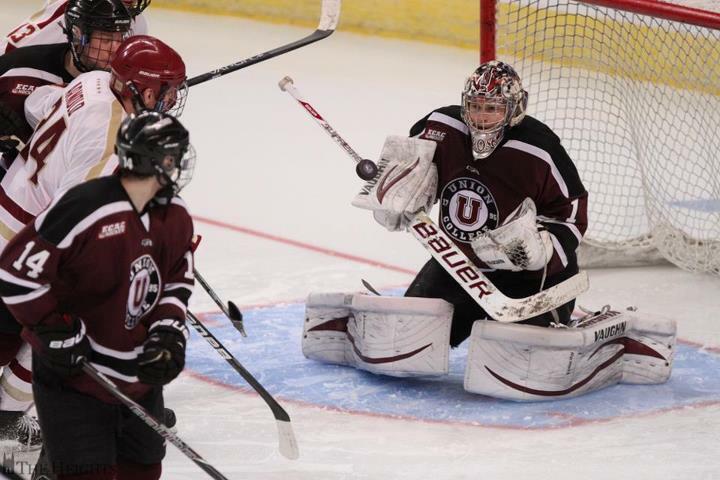 Union College freshman goaltender ALEX SAKELLAROPOULOUS (1) enjoyed a magnificent evening on the road at number one ranked St. Cloud State and lowered his goals-against-average to 2.79 while improving his save percentage to .886 after seven total appearances for the Dutchmen during this current 2013/14 NCAA season in the process. Union College defenseman JEFF TAYLOR (2), the homegrown freshman from Clifton Park, New York, who scored his second goal of this season against the Nittany Lions on Saturday night, pushes Penn State left wing DAVID GOODWIN (9), the first-year player from St. Louis, Missouri, who collected a pair of assists in Sunday evening’s affair with the Dutchmen, off the puck during the NCAA non-conference clash at the Pegula Ice Arena in State College, Pennsylvania. After falling behind considerably on the road against a decided underdog, the visitors demonstrated for a second night in a row exactly the sort of stuff that makes their team a nationally ranked side while scoring four times unanswered in the last half of the contest as # 15 UNION COLLEGE overtook unlucky host PENN STATE 5-4 in a topsy-turvy NCAA non-conference match to successfully complete a two-game Thanksgiving Holiday sweep in State College. In what seemed to be a sign of good things to come, the Nittany Lions capitalized on a power play opportunity only four minutes into the Sunday contest opposite the defending ECAC Conference tournament champions. Canadian legionnaire LUKE JUHA, the sophomore defenseman from Mississauga, Ontario, who has emerged as Penn State’s quarterback on the point, let one rip from the blue line and right wing ZACH SAAR, the monster freshman (6’4″ 235 lbs) from Richland, Michigan, jumped on the rebound to score his first career goal at the collegiate level. Four minutes on, the Nittany Lions doubled the margin — again with the aid of a power play situation — when Juha, himself, hammered home a cross-ice pass from Penn State’s left wing ERIC SCHEID to score his fourth goal of this 2013/14 season. In the meantime, Penn State were doing very well to stay out of the penalty box, themselves, in the first twenty minutes while Nittany Lions goaltender EAMON MCADAM continued to deliver the steady play that the saw the 19-year-old freshman shut down the nationally ranked University of Massachusetts – Lowell over the last two periods of his previous appearance in between the pipes. Penn State defenseman LUKE JUHA (4) was limited to just nineteen games on account on injuries and managed to score just one goal while putting 33 shots on target during the course of the Nittany Lions’ historic 2012/13 campaign but the sophomore Canadian import has blossomed into one of the highest scoring blueliners in all the Big Ten Conference by registering four goals and four assists in eleven NCAA games this season. Saar, however, was sent off for hooking six minutes into the second period and Union College would take full advantage with lightning speed. Only eight seconds, in fact, were required by the Dutchmen before center MIKE VECCHIONE was able to put the puck in Penn State’s net. The visitors were only just beginning to ramp up their offensive attack but, at least for the time being, the Nittany Lions were able to strike back effectively against a school that has reached the prestigious annual NCAA men’s ice hockey tournament the past three years on the trot. Traditionally low-scoring Penn State actually managed to sting Union College twice more — within a span of only one minute and twenty-five seconds — to open up what was a very encouraging 4-1 lead in the second of two Thanksgiving contests with the visiting Dutchmen. First, the in-form Scheid fired his team-leading sixth goal of this season shortly after a faceoff in the offensive zone. Then, the heretofore slumping Canadian legionnaire DAVID GLEN, the sophomore from Fort Saskatchewan, Alberta, who led the Nittany Lions with 16 goals in 27 NCAA games last term, finally broke his scoring drought to net his very first goal of this ‘new’ 2013/14 campaign in a shorthanded situation. Glen was most fortunate to have his hopeful puck, which he had sent in front from off in the corner, bounce off the skate of Union College freshman defenseman JEFF TAYLOR and redirect into the Dutchmen cage, it must be said. For better or worse, it was at this point that visiting head coach RICK BENNETT decided to yank Union College starting goaltender COLIN STEVENS, the homegrown junior from Niskayuna, New York, who was not sharp on Sunday night while surrendering four goals on only a dozen shots. On in the place of Stevens was sent ALEX SAKELLAROPOULOS, the freshman from Tinley Park, Illinois, who had, up to this point in his brief collegiate career, failed to impress thoroughly and, in retrospect, this particular change was precisely the spark that the Dutchmen were in desperate need of. Penn State left wing ERIC SCHEID (19), the redshirt sophomore from Blaine, Minnesota, who has emerged as the Nittany Lions leading scorer with both six goals and ten points in eleven NCAA games this season, had a very productive series against nationally ranked Union College and recorded two goals and five points in the two weekend games against the visiting Dutchmen. As had been the case earlier this term already, it was a propensity to take costly penalties that was at the root of the Nittany Lions’ undoing. At the heart of Union College’s offensive thrust on the power play was talented defenseman SHAYNE GOSTISBEHERE, the junior from Margate, Florida was was picked by the Philadelphia Flyers in the third round (# 78 overall) of the 2012 National Hockey League Draft who is thought by some to be among the most talented of all professional prospects currently skating at the NCAA level. Whatever the case, it was a pair of strikes from Gostisbehere that brought the Dutchmen to within one goal by the conclusion of two periods. Perhaps sensing something skating against opposition who have struggled to find a positive rhythm pretty much all season long, Union College came out like a team possessed to start the final frame and completely overwhelmed Penn State. The Nittany Lions freshman netminder McAdam did all he could to hold the fort for his team but, at one point, the influential shots-on-goal statistic for the third period read an astonishing 18-3 in the Dutchmen’s favor. Almost seven minutes into the third period, the lucky bounces evened out after visiting left wing MATT HATCH had his centering pass ricochet of the skate of Juha and into the Penn State net for the equalizing goal. 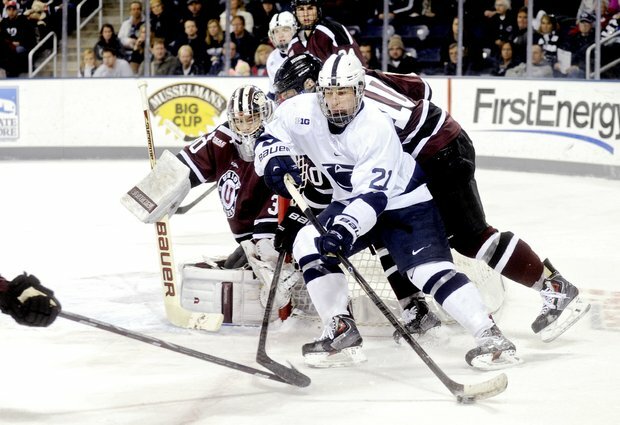 It was almost inevitable that the defending ECAC champions, who wildly outshot the overly cautious Nittany Lions 43-23 on the whole of the contest, would triumph in the end. It would take a bit of stunning individual skill with only three seconds left on the game clock for the Dutchmen’s winner to manifest itself, however. But visiting Canadian legionnaire DANIEL CIAMPINI did step around Penn State freshman defenseman DAVID THOMPSON easily and, after the Nittany Lions rookie netminder McAdam (4 ga, 4.56 avg, .878 save pct) decided to gamble and go for a poke check, the junior left wing from Concord, Ontario, who scored a goal against hapless Penn State (3-7-1) on Saturday night, had himself a memorable match-winner for Union College (8-3-2) on Sunday evening, as well. Penn State sophomore center DAVID GLEN (11) snapped his own personal eleven-game scoring drought and registered a school record 17th career NCAA goal for the Nittany Lions in the process with a most fortuitous shorthanded strike in the second period of Sunday night’s contest against visiting Union College at the Pegula Ice Arena in State College. Penn State defenseman DAVID THOMPSON (22), the homegrown freshman from Glen Mills who has kept several other Nittany Lions rearguards out of uniform while appearing in nine of his team’s first eleven games this season, looks to clear the puck from behind the net under pressure from Union College right wing MATT WILKINS (19), during the see-saw NCAA non-conference match watched by the crowd of 5,177 spectators at the Pegula Ice Arena in State College, Pennsylvania. 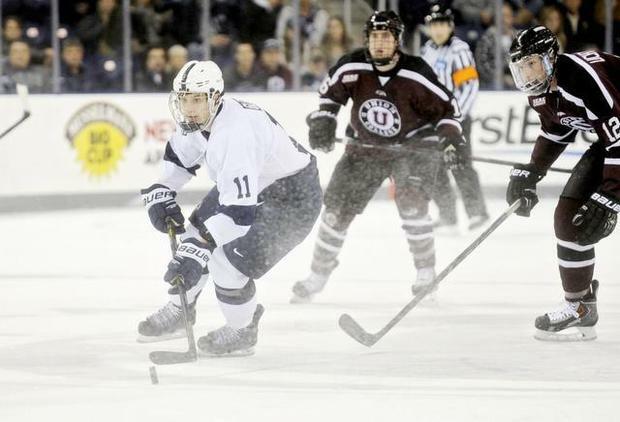 Penn State captain TOMMY OLCZYK (14), the junior left wing from Long Grove, Illinois, who has netted four goals in 33 career varsity contests while particularly standing out as a penalty-killer, battles along the boards with Union College left wing KEVIN SULLIVAN (16), the senior from Darien, Connecticut, who came into the two-game holiday weekend series with the Nittany Lions ranked as the second leading scorer (8 ga, 0 go, 11 as) for the Dutchmen this season, during the see-saw NCAA non-conference match watched by the audience of 5,877 spectators at the Pegula Ice Arena in State College. After falling behind by three goals late in the second period, the hosts used a historically uncharacteristic burst of scoring power to level the contest in the final frame only to have a critical turnover in its own defensive zone not so long afterwards lead directly to its demise as # 15 ranked UNION COLLEGE clipped unfortunate PENN STATE 4-3 in the first of two Thanksgiving Holiday games. 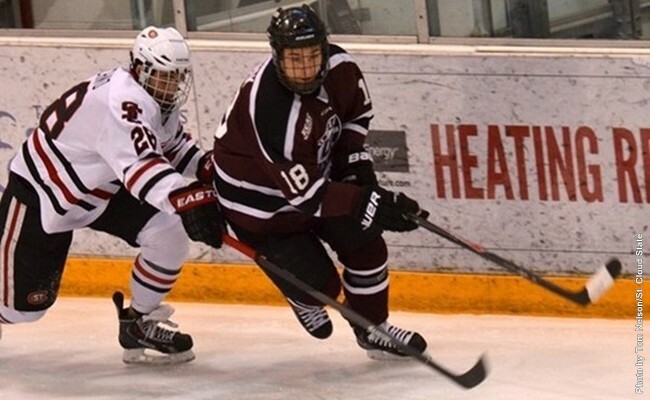 The defending ECAC Conference tournament champions were without leading scorer DANIEL CARR, the injured senior left wing from Sherwood Park, Alberta, who had recorded seven goals and added another seven assists in the Dutchmen’s first eleven games this season. Nevertheless, the visitors were still able to spend a good portion of the opening twenty minutes in the Nittany Lions’ defensive zone. And Union College went ahead after senior left wing KEVIN SULLIVAN used the backhand to redirect a shot from right wing MATT WILKINS down and through the five hole of Penn State goaltender MATTHEW SKOFF and notch his very first goal of this season at the 11:11 mark. The Dutchmen continued to apply pressure to begin the second period, as well, and doubled their advantage when a right point shot from defenseman JEFF TAYLOR, the homegrown freshman from Clifton Park, New York, found its way past Skoff less than a minute and twenty seconds into the middle frame. Penn State had done well to kill three off three penalties on the trot but that success was abruptly halted late in the second period when Nittany Lions right wing JACOB FRIEDMAN, the seldom-used junior from West Bloomfield, Michigan, went to the penalty box for tripping. A long pass from Union College defender SHAYNE GOSTISBEHERE, the third round pick (# 78 overall) of the Philadelphia Flyers at the 2012 National Hockey League Draft, sent Canadian legionnaire DANIEL CIAMPINI in clear and although Skoff was able to make the initial save, the junior left wing from Concord, Ontario, was still able to control the puck and slip a backhand through the legs of the beleaguered Nittany Lions netminder to score his sixth goal this term. 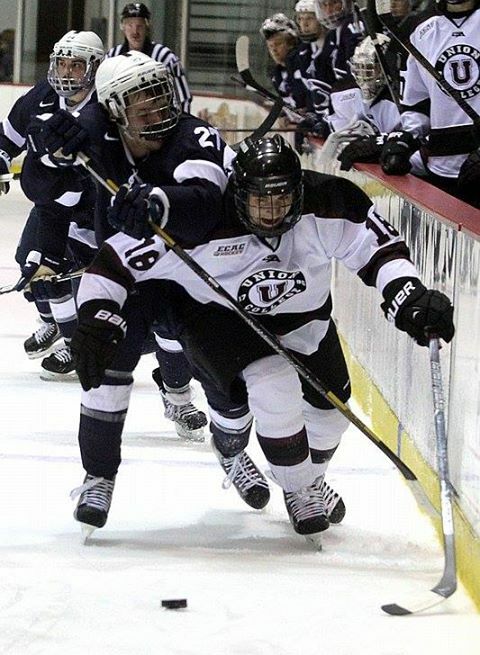 Penn State defenseman PATRICK KOUDYS (3), the Canadian import from Smithville, Ontario, scored exactly two goals in 57 NCAA games over the course of two seasons with Rensselaer Polytechnic Institute in upstate New York before transferring after the conclusion of the 2011/12 campaign. The home fans finally had something to cheer about late in the second period after Union College left wing MATT HATCH was sent to the sin bin for tripping with less than a minute to skate before the second intermission. This because Nittany Lions left wing ERIC SCHEID, the redshirt sophomore who scored six goals in 30 NCAA games for the University of Alaska – Anchorage two seasons ago, was able to navigate his way through the Dutchmen defense and beat visiting puck tamer COLIN STEVENS to notch his team-leading fifth goal for Penn State on this 2013/14 campaign at the 19:37 of the second period. Thus ended a Nittany Lions’ scoreless stretch of 99 minutes and 18 seconds against Stevens, who, as a sophomore, had also recorded a 2-0 shutout for Union College at the expense of head coach GUY GADOWSKY’s side a year ago in upstate New York. The entire Penn State team received a much-need boost of self-confidence seven minutes into the third period when Canadian legionnaire PATRICK KOUDYS, the defenseman who was tabbed by the Washington Capitals in the fifth round (# 147 overall) of the 2011 NHL Draft, rifled a long slapshot from the blue line right over the shoulder of Stevens and into the upper ninety of the net. It was a first career strike in a Nittany Lions’ uniform for Koudys, a redshirt junior who originally began his NCAA career at Rensselaer Polytechnic Institute. “That goal gave us some belief,” the Penn State skipper Gadowsky would later confess. A little more than three minutes later, the suitably-inspired Nittany Lions accomplished a feat that the Penn State varsity men’s ice hockey team had never pulled off in 36 NCAA contests previously — come all the way back from three goals down to equalize. But then veteran Penn State center TAYLOR HOLSTROM, the redshirt junior from Yorba Linda, California, who was the Nittany Lions’ fourth-leading scorer last term with 17 points (24 games, 9 goals) made a fine play in the corner to provide a pass for right wing KENNY BROOKS to emphatically finish with a one-timer. It was a well-deserved tally for Brooks, the seemingly snake-bit sophomore who had totaled 26 shots-on-goal through his first eight games of this current season but had been, heretofore, held off the scoresheet. 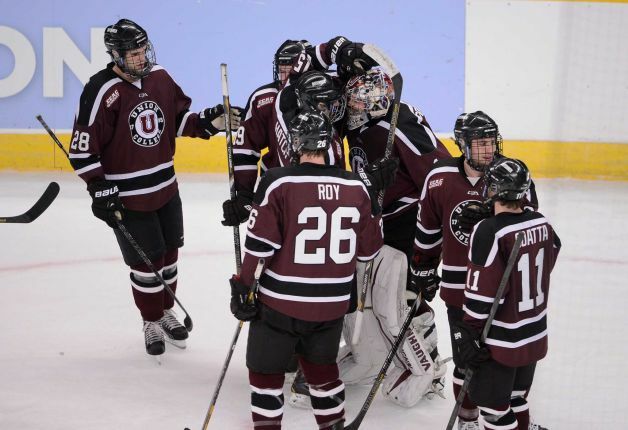 Union College quickly recovered from losing its comfortable position, however, and demonstrated why the Dutchmen are, indeed, a very high calibre program who have qualified for the annual NCAA men’s ice hockey tournament the last three years in succession. A turnover from Koudys allowed Ciampini to set up MAX NOVAK, the junior center from Oak Ridge, New Jersey, who scored two goals in the Final of the ECAC Conference tournament when Union College turned back Brown University 3-1 last spring, for a first-time wrist shot from the faceoff circle with a little less than seven minutes to play. And so the visiting Dutchmen were still able to triumph at the Pegula Ice Arena but could not deny that they had been seriously tested. 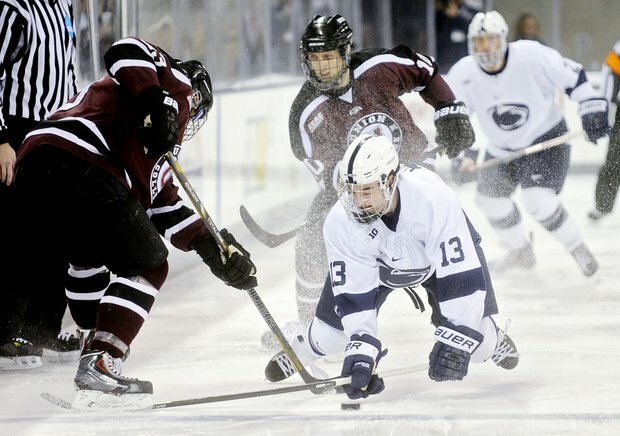 Penn State right wing KENNY BROOKS (13), the sophomore from Las Vegas, Nevada, who scored two goals and added ten assists for the fledgling Nittany Lions last season, fights for the puck along the wall with a pair of Union College players during the NCAA non-conference clash watched by the audience of 5,877 spectators at the Pegula Ice Arena in State College. Union College goaltender COLIN STEVENS (30), the junior from Niskayuna, New York, who registered a whitewash in his first career start against the Nittany Lions twelve months ago, pays close attention as Penn State center RICKY DE ROSA (21), the homegrown freshman from Ashton who has already scored two goals in his first eight varsity contests this season, controls the puck at the side of the net during the NCAA non-conference affair at the Pegula Ice Arena in State College, Pennsylvania. Union College’s playmaking defenseman SHAYNE GOSTISBEHERE (14), the third round choice (# 78 overall) of the Philadelphia Flyers at the 2012 National Hockey League Draft who was a member of the United States’ gold medal-winning entry at the annual IIHF World Junior Championships tournament hosted by the Russian city of Ufa last season, is pursued from behind by Penn State right wing MICHAEL MCDONAGH (8) during the last year’s NCAA meeting at the Frank L. Messa Rink in Schenectady, New York. Riding the massive wave generated by three consecutive NCAA tournament appearances at the moment, two-time defending ECAC Tournment champion UNION COLLEGE (currently ranked # 15 by USCHO.com and # 16 by USA Today) are easily enjoying the most successful era in school history under the effective leadership of RICK BENNETT, the former Providence College right wing who once skated fifteen games in the vaunted National Hockey League for the legendary New York Rangers before getting into coaching. 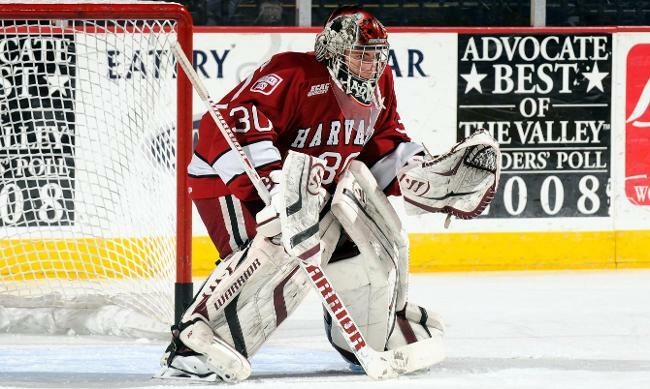 The Dutchmen actually lost four of its five top producers on the scoring chart from last season as well as standout goaltender TROY GROSENICK, the NCAA First Team (East) All-America selection in 2012 who is now tending the nets for the Worcester Sharks in the American Hockey League. But Union College, who knocked defending national champion Boston College out of the annual NCAA men’s ice hockey tournament last spring before being unceremoniously dumped, themselves, by ECAC conference rival Quinnipiac University at the regional final stage, do have a good supply of experienced players returning to the fold. And, not surprisingly, the Dutchmen have added a few promising freshmen to their ranks for this season, as well. 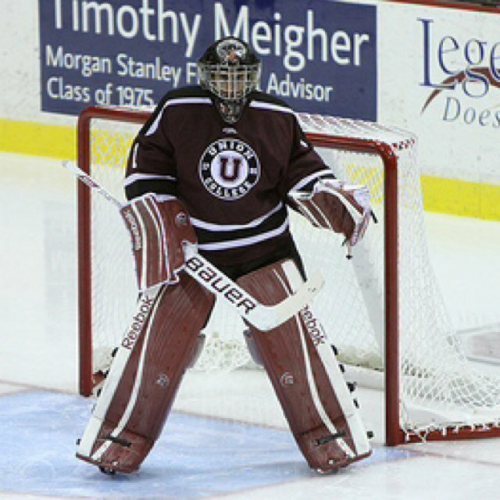 Union College caught a bad break in its very first game of this 2013/14 campaign when starting goaltender COLIN STEVENS, the homegrown junior from Niskayuna who had posted good numbers (23 ga, 1.96 avg, .921 save pct) in limited action during his first two years with the Dutchmen, went out injured after only six minutes against visiting Bowling Green State University. Union College goaltender COLIN STEVENS (30) collides with Bowling Green State University right wing BRYCE WILLIAMSON (12) during the Dutchmen’s 2013/14 season opener at the Frank L. Messa Rink in Schenectady, New York. Untested youngster ALEX SAKELLAROPOULOS, the 19-year-old freshman from Tinley Park, Illinois, was not necessarily prepared to assume the first string mantle (5 ga, 3.46 avg, .846 save pct) as Union College managed to register just one victory in its first five matches of this season. Since the return of Stevens to the line-up, however, the Dutchmen have rattled off five wins at the last six attempts and look to retain that run of good form with a two-game sweep on the road at Penn State. A year ago last November, it should be remembered, Stevens recorded a shutout for Union College against Penn State in upstate New York when the two schools met for the first time ever. The Dutchmen have been playing stifling defensive hockey all term while limiting their opponents to 23 or fewer shots-on-goal in nine of eleven games thus far — no team has totaled more than 29 shots-on-goal in any one single contest against the stingy Union College defenders this season. Spearheading the blue line corps is undersized (5’11″ 170 lbs) playmaker SHAYNE GOSTISBEHERE, the junior from Margate, Florida, who is the NHL prospect of the Philadelphia Flyers and has already amassed 17 goals and 60 points in 88 NCAA games over two-plus seasons for the Dutchmen. Canadian legionnaire MAT BODIE, the skinny senior (6’0″ 165 lbs) from East St. Paul, Manitoba, who has racked up 76 assists and 96 points in 125 career NCAA games for Union College to date, is another highly-experienced defenseman who can move the puck profitably. Meanwhile, the one player at the back for the Dutchmen who does have anything resembling bona fide “good size” is CHARLIE VASATURO (6’3″ 200 lbs), the junior from Sewell, New Jersey. Union College defenseman MAT BODIE (22), the experienced Canadian import who was chosen as First Team All-ECAC Conference while also being named Second Team (East) All-America at the conclusion of his sophomore campaign in 2012, was honored by officials as the Third Team All-ECAC Conference selection at the end of last season. Canadian legionnaire DANIEL CARR, the senior left wing from Leduc, Alberta, who finished tied for tops with 16 goals and third on the overall scoring chart with 36 points in 40 NCAA contests for the Dutchmen last term, is one dangerous player who returns to power the Union College attack again — the sturdy (6’0″ 195 lbs) veteran, who was named to the ECAC All-Tournament team last spring, is off to a very productive start once again this season (11 ga, 7 go, 14 pts), as well. Union College have certainly been bolstered from the return to the line-up of experienced center MAX NOVAK, the junior from Oak Ridge, New Jersey, who scored two goals against Brown University in the ECAC Tournament Final last spring but missed the first five games of this season thru injury. Canadian legionnaire DANIEL CIAMPINI, the junior left wing from Concord, Ontario, who notched 11 goals in 36 games for the Dutchmen as a sophomore, and countryman MATT WILKINS, the second-year winger from Kimberley, British Columbia, are two other influential forwards back once again. 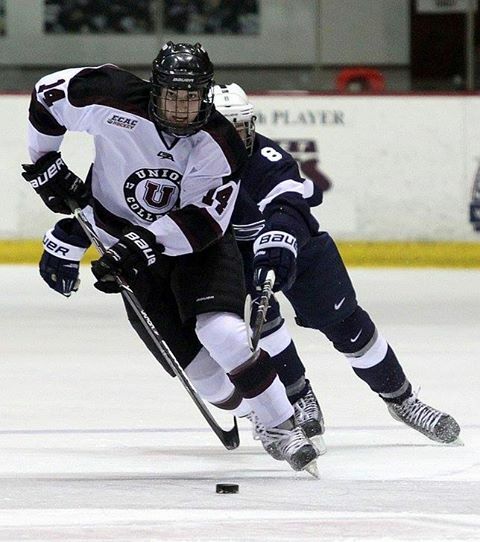 One pleasant surprise has been the production of KEVIN SULLIVAN, the senior right wing from Darien, Connecticut, who registered ten assists in 36 appearances for Union College last season but has already totaled 13 helpers in just eight contests so far this term. Canadian legionnaire MICHAEL PONTARELLI, the skillful, little freshman (5’7″ 170 lbs) from Laval, Quebec, created a measure of excitement by scoring four goals and adding three assists for Union College in the early going but has cooled off considerably as of late. The towering freshman ELI LICHTENWALD (6’6″ 235 lbs) has been impressive (2 go, 4 pts) since being placed at center on a line with Carr and Wilkins by the Dutchman bench boss Bennett three games ago. 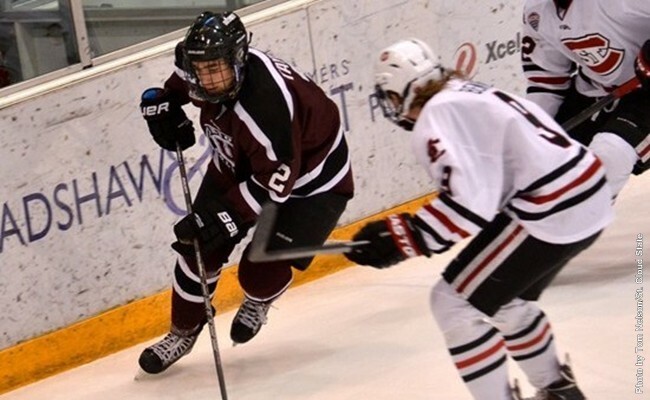 The native of Saskatoon, Saskatechewan, notched a goal in each of Union College’s two games with Rensselaer Polytech Institute two weekends ago and had two assists in the Dutchmen’s 3-0 trimph over nationally ranked Cornell University prior to that. Union College DANIEL CARR (9), the Canadian import who has already recorded 63 goals and 121 points in 132 career NCAA games for the two-time defending ECAC Tournament champion Dutchmen, fights off the check of Penn State defenseman NATE JENSEN (24) during the non-conference meeting a year ago at the Frank L. Messa Rink in Schenectady, New York. Penn State right wing MAX GARDINER (27), the redshirt sophomore transfer from the University of Minnesota who was tabbed by the St. Louis Blues in the third round (# 74 overall) of the 2010 National Hockey League Draft, puts a halt to the progress of Union College center MAX NOVAK (18), the sophomore from Oak Ridge, New Jersey, who was destined to score two goals for the Dutchmen against Brown University in the Final of the 2013 Hockey East Tournament, during the NCAA non-conference affair at the little Frank L. Messa Rink in Schenectady, New York. As the fledgling PENN STATE varsity ice hockey team faced-off against a nationally-ranked opponent for the very first time in school history, Nittany Lions freshman goaltender MATTHEW SKOFF turned aside what was at that time a career-high 40 shots but a first period goal from Dutchmen right wing WAYNE SIMPSON, the native of Boxborough, Massachusetts, who now makes a living skating professionally for the South Carolina Stingrays in the East Coast Hockey League, and a shutout performance by backup goaltender COLIN STEVENS, the homegrown sophomore from Niskayuna, propelled UNION COLLEGE to victory in upstate New York. Penn State goaltender MATTHEW SKOFF (31), the homegrown freshman from McKees Rock who was on his way to establishing himself as the Nittany Lions’ clear number one during the historic 2012/13 NCAA campaign, can do nothing as Union College Canadian legionnaire DANIEL CIAMPINI (17), the undrafted sophomore left wing from Concord, Ontario, prepares to celebrate his gritty first period goal during the non-conference match-up at the Frank L. Messa Rink in Schenectady, New York. An early third period power play strike from defenseman SHAYNE GOSTISBEHERE, the talented sophomore who was selected by the Philadelphia Flyers in the third round (# 78 overall) of the 2012 National Hockey League Draft, snapped the deadlock and a critical insurance tally from Canadian legionnaire MARK BENNETT, the little-used and low-scoring sophomore right wing from Oakville, Ontario, less than five minutes later sealed the deal as defending ECAC tournament champion UNION COLLEGE dispatched visiting PENN STATE 4-1 to complete the two-game weekend sweep of the historic Nittany Lions squad competing at the NCAA’s elite Division I level for the very first time ever. Penn State center TAYLOR HOLSTROM (28), the redshirt sophomore transfer from Mercyhurst University who went on to finish the 2012/13 season as the third-leading scorer with both nine goals as well as 17 points after skating in 24 varsity games for the fledling Nittany Lions, and Union College left wing DANIEL CIAMPINI (17), the Canadian import who would total 11 goals and 21 points from 36 games as a sophomore for the Dutchmen, compete for the puck in the corner during the NCAA non-conference clash at the Frank L. Messa Rink in Schenectady, New York. Union College’s Canadian legionnaire DANIEL CIAMPINI (17), the undrafted sophomore left wing from Concord, Ontario, looks to make a play with the puck in the Boston College defensive zone during the NCAA East Regional Semifinal contest watched by the crowd of 6,253 spectators at the Dunkin Donuts Center in Providence, Rhode Island. A well-taken goal midway through the first period and two lightning-fast strikes at the start of the second session left the defending champion to chase a contest it never had any real hope of catching as # 12 UNION COLLEGE skated to a relatively-easy 5-1 triumph over # 6 BOSTON COLLEGE in the opening round of the 2013 NCAA men’s ice hockey tournament. Things might have gone a bit differently for Boston College, who have been crowned the national champion three times in the past five seasons, had the deflected shot from STEVEN WHITNEY, the homegrown senior from Reading who led the Eagles with 26 goals in 38 games this season, done more than smash off the crossbar almost six minutes into the contest. But Union College, who won the Eastern Collegiate Athletic Conference post-season tournament title for the second consecutive year this spring, went to the lead on the power play after Canadian legionnaire JOSH JOORIS tallied the first of his two goals at the 9:25 mark of the opening period. The junior left wing from Burlington, Ontario, took a nifty, cross-ice pass from KEVIN SULLIVAN, the junior right wing from Darien, Connecticut, and promptly one-timed the puck past Boston College goaltender PARKER MILNER, the undrafted senior from Pittsburgh, Pennsylvania, who was chosen as the Most Oustanding Player at the NCAA’s Frozen Four last season. 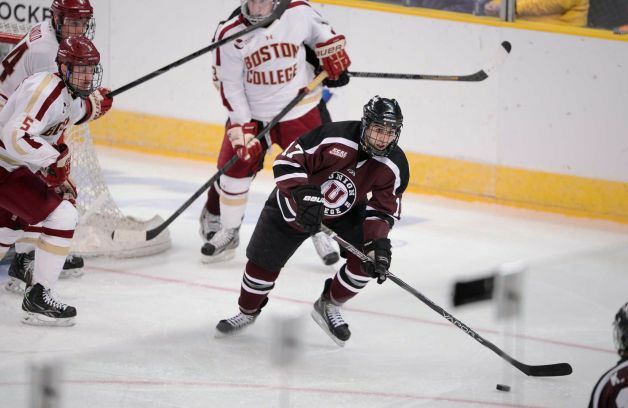 Jooris notched his second goal of the game only 39 seconds into second period after lurking at the far post and slamming home the centering pass from right wing WAYNE SIMPSON, the senior from Boxboro, Massachusetts, who leads Union College in scoring with 35 points (16 goals) this season. Boston College’s Canadian legionnaire ISSAC MACLEOD, the junior defenseman from Nelson, British Columbia, who was tabbed by the San Jose Sharks in the fifth round (# 13 overall) of the 2010 NHL Draft, might have done more on this particular play. The Dutchmen, who did advance to the Frozen Four last season but have never faced-off against Boston College previously, scored yet again just 25 seconds further on when fourth line left wing COLE IKKALA, the junior from Philadelphia, Pennsylvania, who had scored four goals in his entire college career coming into this NCAA contest against the defending champion Eagles, beat the obviously rattled Milner to the short side with a long wrist shot from way out along the boards. Union College defenseman SHAYNE GOSTISBEHERE (14), the 19-year-old sophomore from Margate, Florida, was the third round pick (# 78 overall) of the Philadelphia Flyers at the 2012 National Hockey League Draft last summer. Boston College defenseman ISSAC MACLEOD (7) looks back at the puck as netminder PARKER MILNER, the senior who appeared in all but three of the Eagles’ contests this season (37 ga, 2.66 avg, .911 save pct), closes his eyes in frustration after upstart Union College scored a power play goal late in the second period during the one-sided NCAA East Regional Semifinal contest at the Dunkin Donuts Center in Providence, Rhode Island. Union College, who outshot Boston College by the considerable margin of 27-14 over the course of the first two periods, grabbed a commanding 4-0 lead with just under two minutes to play before the second intermission when diminutive sophomore defenseman SHAYNE GOSTISBEHERE, a relatively high NHL draft pick of the Philadelphia Flyers, hammered home a shot from the point on the power play and scored his eighth goal of this season. The irrepressible Dutchmen netted a fifth consecutive goal without answer by the Eagles and scored a third goal of the evening with the benefit of the man-advantage early in the third period. Simpson started another rush before Canadian legionnaire GREG COBURN, the senior rearguard from Saskatoon, Saskatchewan, who leads all Dutchman defenseman with 28 points this season, provided countryman DANIEL CIAMPINI with a good pass to redirect past Milner for his 10th goal of this term. Boston College, a five-time national champion, overall, who were appearing in the annual NCAA tournament for the 32nd time in school history, continued to miss injured forward KEVIN HAYES (27 ga, 6 go, 25 pts), the homegrown junior from Dorchester who was the first round choice (# 24 overall) of the Chicago Black Hawks at the 2010 NHL Draft but has been out of action since the end of February after undergoing surgery to repair his right quadriceps muscle. The Eagles, who ended their 2012/13 campaign with the record of 22 wins against 12 losses with four ties, salvaged a measure of pride and avoided the shutout with a little less than four minutes to play in the final period. Boston College left wing JOHNNY GAUDREAU, the prolific sophomore from Carneys Point, New Jersey, who was selected in the fourth round (# 104 overall) of the 2011 NHL Draft by the Calgary Flames, netted his 21st goal of this season after a feed from defenseman PATRICK WEY, the experienced senior from Pittsburgh, Pennsylvania, who was chosen in the fourth round (# 115 overall) of the 2009 NHL Draft by the Washington Capitals. Gaudreau, who was later named as one of the three finalists for the prestigious Hobey Baker Award given annually to the nation’s best college hockey player, ended up as the Eagles’ leading scorer having totaled 51 points in 35 games this term. Union College goaltender TROY GROSENICK, the undrafted junior from Brookfield, Wisconsin, who was honored as a First Team (East) All-America selection after appearing in 34 games (1.65 avg, .936 save pct) for the Dutchmen during the 2011/12 campaign, stopped 29 of 30 shots against defending national champion Boston College in the 2013 NCAA East Regional Semifinal contest at the Dunkin Donut Center in Providence, Rhode Island. Notes — although undrafted by any National Hockey League club, Boston College senior right wing STEVEN WHITNEY would be signed to a professional contract by the defending Calder Cup champion Norfolk Admirals of the American Hockey League and went on to register three goals in his first three AHL games. Union College sophomore right wing MAX NOVAK (18), the Garden State native of Oak Ridge who was recruited by the Dutchmen from the roster of the New Jersey Hitmen in the Eastern Junior Hockey League, celebrates the first of his two critical goals against valiant Brown University in the ECAC Tournament Final watched by a crowd of 4,107 spectators at the Boardwalk Hall ice facility in Atlantic City, New Jersey. Stifling defense, standout netminding and three goals from a local New Jersey product combined to propel unheralded UNION COLLEGE to a second consecutive Eastern Collegiate Athletic Conference post-season title in Atlantic City and guarantee the Dutchmen the accompanying automatic berth in the annual NCAA tournament this year. Union College, who advanced to the Frozen Four at the NCAA’s Division III national championships twice in the 1980s before joining the ECAC in 1991, have now qualified for the NCAA tournament at the elite Division I level for a third consecutive season. 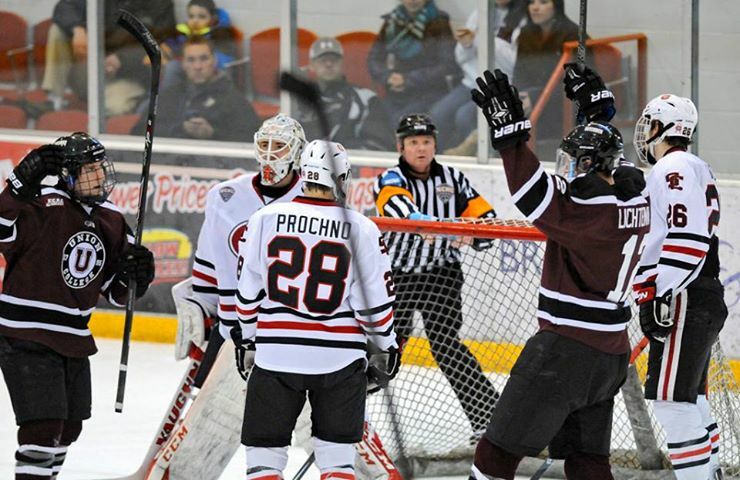 The Dutchmen, to review, reached the Frozen Four last term before falling to Ferris State in the semifinal. It is highly questionable whether or not Union College, who now fashion the record of 21 wins against 12 losses with five ties for this 2012/13 campaign, would have been chosen by the NCAA selection committee this year had the Dutchmen not won the ECAC’s annual post-season tournament for the second time in school history. It was either of the two schools from Connecticut, # 1 QUINNIPIAC UNIVERSITY (Hamden) and # 5 YALE UNIVERSITY (New Haven), who were the odds-on favorite to win the ECAC’s Whitelaw Cup in Atlantic City. But clear underdog BROWN UNIVERSITY surprisingly blanked the number one ranked team in the Land 4-0 thanks in large part to shutout goaltending from ANTHONY BORELLI, the 24-year-old junior from Grand Island, New York, and a pair of strikes from Canadian legionnaire MATT LORITO, the sophomore from Oakville, Ontario, who led the Bears with both 22 goals and 37 points this season. 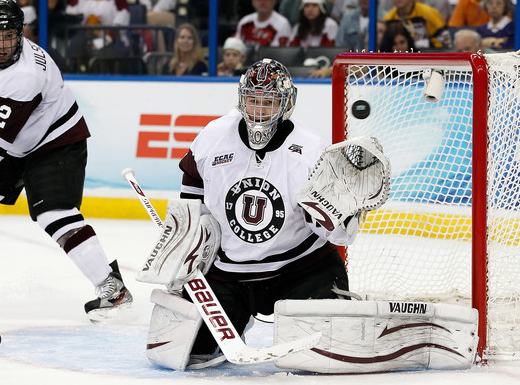 Union College advanced after netminder TROY GROSENICK, the 23-year-old junior by way of Brookfield, Wisconsin, turned aside all 34 shots from the Bulldogs as the Dutchmen triumphed 5-0. Yale University’s Canadian legionnaire CARSON COOPER (9), the undrafted freshman from Bow Island, Alberta, who scored just one goal in 33 NCAA games for the Bulldogs this season, cannot get the puck past the wall of Union College players during the ECAC semifinal contest at the Boardwalk Hall arena in Atlantic City, New Jersey. Union College have just two players who have been reserved by National Hockey League clubs but both SHAYNE GOSTISBEHERE, the undersized (5’11″ 160 lbs) sophomore from Margate, Florida, who was selected by the Philadelphia Flyers in the third round (# 78 overall) of the 2012 NHL Draft last summer, and TIM BOYLE, the freshman from Hingham, Massachusetts, who was chosen in the fourth round (# 106 overall) of the 2012 NHL Draft by the Ottawa Senators, happen to be defensemen. Tim Boyle just so happens to be the younger brother of former Boston College star and current New York Rangers center BRIAN BOYLE. But the 20-year-old rearguard has not yet established himself on the Union College blue line and appeared in just 15 NCAA games (0 go, 2 as) this term. Gostisbehere, however, would be needed as Brown University, who were making their first appearance in the ECAC Tournament Final since 1993, generated a good deal of pressure against the Dutchman at the Boardwark Hall in Atlantic City. Albeit it a bit against the run of play, Union College took the lead when Canadian legionnaire DANIEL CARR, the junior from Leduc, Alberta, scored for the second time in as many games at the 10:18 mark of the opening period. Carr’s tally tied Union College right wing WAYNE SIMPSON, the senior from Boxboro, Massachusetts, who also netted in the ECAC semifinal victory over Yale University, for the team leadership in goal-scoring. New Jersey native MAX NOVAK, the sophomore right wing who had also struck in the ECAC semifinal win over Yale, re-emerged and scored two back-breaking goals for Union College on either side of the first intermission to effectively end the hopes of Brown University. The Bears pulled one goal back in the second period on a power play strike by Canadian legionnaire DENNIS ROBERTSON, the junior defenseman from British Columbia who is the only current Brown University skater to have been drafted by an NHL club (Toronto Maple Leafs, sixth round – # 173 overall, 2011). But, despite being outshot 11-1 in the third period, the Dutchmen made a concentrated effort to defend what had already been gained and achieved that aim with aplomb. Union College junior goaltender TROY GROSENICK, who stopped 66 of 67 shots in consecutive games against Ivy League opponents Yale and Brown at the Boardwalk Hall in Atlantic City, was named to the ECAC tournament All-Star team along with three other Dutchmen in senior defenseman GREG COBURN, left wing DANIEL CARR and right wing MAX NOVAK; representing Brown University on the 2013 ECAC tournament All-Star team were defenseman DENNIS ROBERTSON and center MATT LORITO. NOTE — this season’s successful Brown University squad, which finished with an overall record of 16 wins against 14 losses with six ties, prominently featured two Philadelphia-area products in senior right wing JEFF RYAN from Media (28 ga, 6 go, 14 pts) and junior defenseman JAKE GOLDBERG from Langhorne (32 ga, 4 go, 8 pts).